Quick and easy, Pork Spiedini Hoagies assemble in minutes, cook in minutes, and are devoured in seconds! 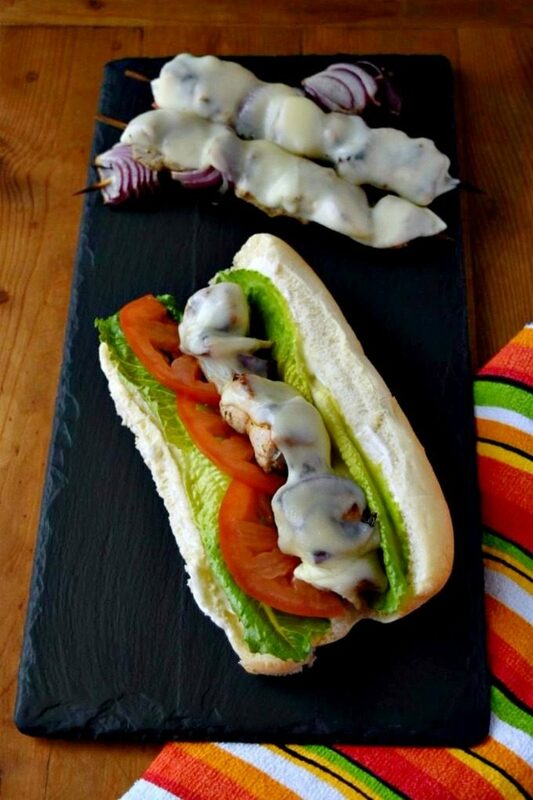 Your family will love how delicious these hoagies are and you’ll love how quick they are. I cannot believe Labor Day is next weekend. Can you? Where did summer go? Not that I mind saying goodbye to the heat. Yes, I know the summer weather isn’t going to be over as soon as it’s the day after Labor Day. Give me some credit! In this area, once school starts, the traffic patterns change. And, consequently, the commuting patterns change, too. Not enormously, but at least enough to be noticeable to those who travel the same path day in and day out for work. Since school started the day after Labor Day growing up, it really wasn’t a happy time. It meant that fun in the sun was over and it’s time to hit the books. Labor Day also meant the pools were closing and no more hanging out with my friends there. You see what I mean? Labor Day has considerable negative memories for me. What little I remember, anyway. I do remember having to make dinners on the weeknights. The fun part about that are the memories of shopping with Dad. And all the memories of watching cooking shows on PBS with him. That was Saturday mornings for us if yard sale-ing wasn’t on the agenda. I love how these stream of consciousness posts take me to places I didn’t even think of when I sat down to write this post. However, I will say that Dad had a considerable influence over the day to day meal and menu prep in the kitchen when I was growing up. He was the chef. Now, not to leave Mom out, she’s where I get the baking skills from. So, all those macaron recipes are from her talents in the kitchen. She also inspired the Norwegian cookies. And now you know why I say I have the best of both worlds! I don’t know many who had the kitchen knowledge I did growing up. I’m horrible with photographing sandwiches. Really I am. You can see a bit of the pork underneath the melted provolone cheese. It’s so juicy and tender. Since it’s sprinkled with Italian seasoning and garlic salt, it has great Italian flavor. Because a spiedini is basically an Italian kabob. At least that’s what I’ve read. And that’s what I’m going with for this recipe. Spiedini sounds so much better than kabob. Like aubergine sounds so much better than eggplant. And courgette sounds so much better than zucchini. Admit it. Zucchini is not a fun word to say. It’s hard and doesn’t roll off the tongue well. You know what’s a fun word to say? Djabouti. I occasionally come across that one at work. And then proceed to do my Djabouti dance while chanting the word. Yes, I realize that I am way off topic now. Getting back to these spiedini, I made these for lunch. Seriously. That’s how quick and easy these are to make. It took longer to bake the fries we had with them than the actually hoagies themselves. Considering the ingredients are pretty common in any kitchen, you can probably whip these up for dinner tonight! Or for lunch tomorrow. For us, Labor Day will be another binge watching some show day. It’s what we do on the weekends unless we get invited somewhere. That’s a rare occasion. However, things change! We need to network so the hubs can sell more houses. How will you celebrate your Labor Day? I hope you’ll join our chat at 7pm ET this Sunday to tell us all about your Labor Day menu ideas. Quick and easy, Pork Spiedini Hoagies assemble in minutes, cook in minutes, and are devoured in seconds! 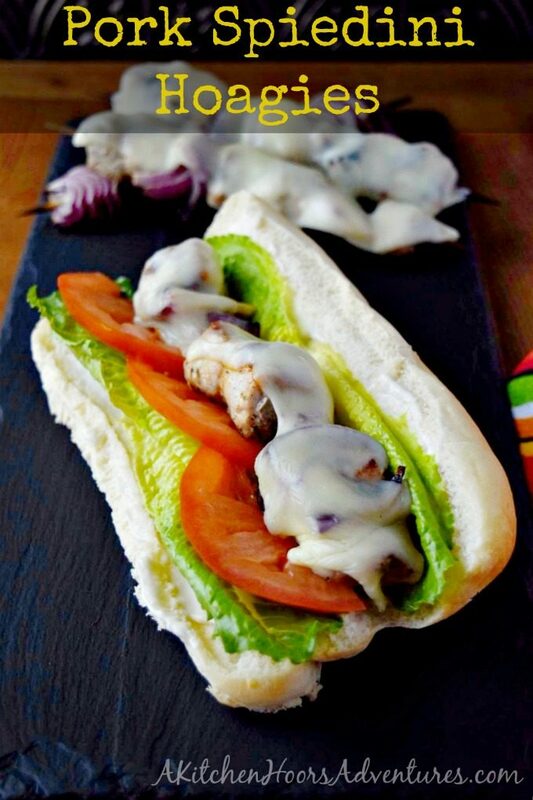 Your family will love how delicious these hoagies are and you'll love how quick they are. Sprinkle the pork with the Italian seasoning, garlic salt, and black pepper. 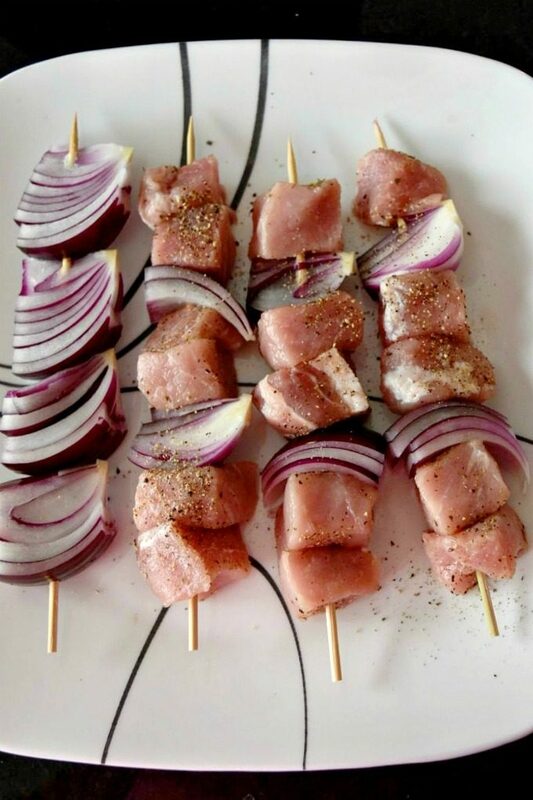 Put two pieces of pork on each skewer, then thread one wedge of onion, two more pieces of pork, another onion wedge, and finally one piece of pork. Grill 4 minutes on each side or until the pork is 160. Top each spiedini with one slice of cheese cut in half and cook an additional 1 to 2 minutes or until the cheese is melted. Remove them from the grill and allow them to rest 5 minutes. Remove the pork from the skewer and place on hoagie roll. Top with lettuce tomatoes, and additional grilled onions and serve. My kind of sandwich! Deliciousness in every bite! For sure! And so easy to make. Win win! This sandwich looks so good! Labor Day is not one of my favorite holidays either because it means summer is over. I’m all about the hot weather and humidity being over, but not the produce. So creative! They look absolutely delicious! I know what you mean about photographing certain foods! Especially when they taste amazing and you just can’t get that perfect shot. Stews are the worst! Sandwiches aren’t easy, either. Though, I can tell these are winners. Can’t go wrong with that gooey cheese topping! YES! Stew or soup is not easy at all. Thank you! Cheese is always a winner. What a great looking sandwich. I’m hungry now and I just got done eating not an hour ago!